Being rather partial to the odd piece of jewellery here and there I thought I would share with you today the new jewellery lookbook from The Little Deer. This rather unique site clearly has a passion for design and individuality, supporting small brands and independent designers is a clear focus and one that for me is extremely important. With the start of the new season there comes a fresh look with Wishes of Spring. I’ve picked out three of my favourite items from the site with the first being the Triangle Necklace in Black by Rachel Loves Bob. This is a stand out piece for me and would look fantastic with a monochrome outfit, I’ll always find a time to wear monochrome no matter what time of year it is. Next up I chose the Single pendant in Emerald Green by Wold and Moon which again is a stand out item that I think is simply beautiful, just look at that beautiful colour; it also comes in a gold glitter which is equally stunning. My last choice was the White and Silver Agate Druzy Necklace by Delilah Dust. Delilah Dust is brand I’m aware of so it was nice to see them featured over on The Little Deer. I’ve always wanted to purchase a druzy necklace because they’re so unusual and bring out the inner geology nerd in me. What do you think of the jewellery on The Little Deer? I know I certainly have my eye on a few things. 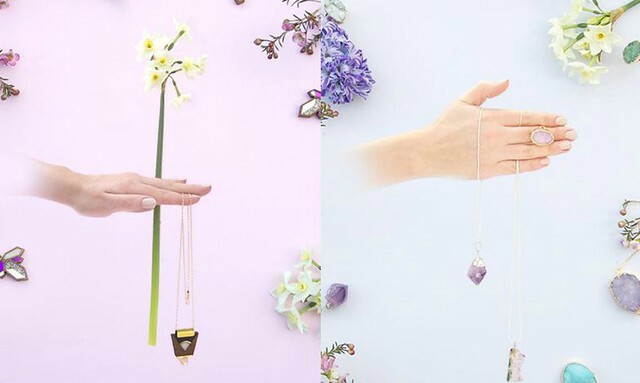 I was recently lucky enough to be offered a place on The Little Deer Blogger Programme which is why I’m sharing this post with you today as I thought some of you may be interested in some of the pretty jewellery items that are available to buy at the moment. I simply had an email about this lovely lookbook launch and naturally wanted to share this information with you, I hope you all like it!